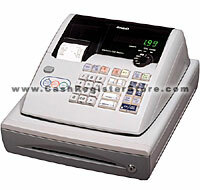 Casio PCR-T275 Electronic Cash Registers at Cash Register Store. The Casio PCR-T275 is almost our lowest cost basic register. It is although our most fully featured cash register for under $199. Although 15 departments are featured, there are 5 direct one touch keys to utilize before needing to use a shift level. The PCR-T275 features a ightweight cash drawer with media slot for easy deposit of large bills and checks under the cash drawer without lifting out the cash tray. Another great feature is the thermal printer with a receipt on/off switch. Thermal printers save time in printing receipts and do not require ink ribbon replacements. With an on/off switch for the printer, save money on paper if you do not need to give out a receipt at the time of sale. (W) 13" x (D) 17 ¾"x (H) 10"